Nationwide, Iranian truckers have united in protest demanding better wages. Their protest, in conjunction with rising levels of resistance to Iran’s leader, Ali Khamenei, signify a changing tide in Iranian society. Organized labor bridges social divides, allowing for mass mobilization and nonviolent collective action utilizing economically derived leverage as a means of social resistance. “Iran Truckers join nationwide push for change” by Jubin Afshar. openDemocracy. May 28, 2018. 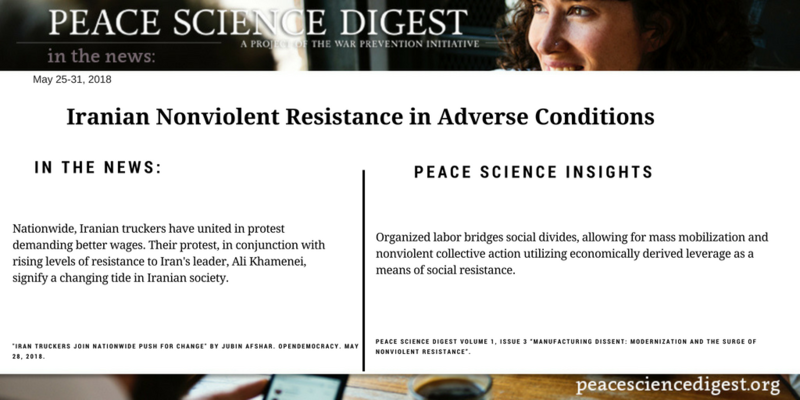 Peace Science Digest Volume 1, Issue 3 “Manufacturing Dissent: Modernization and the Surge of Nonviolent Resistance”.